Learn Step By Step How To Create Stunning Graphics Using Photoshop Quickly And Easily. How to get started with Photoshop. How to get use to the interface and configure your settings. How to create your first image and which features to select when doing it. How to work with the settings when editing images. How to quickly and easily enhance an image. How to generate images with multiple extension. How to use the configuration settings and be creative. Any version of Adobe Photoshop. No previous knowledge or experience with Photoshop required. What if you can finally create amazing graphic designs without spending a dime? No Need To Hire A Graphic Designer !!! Even if you are new to the world of design, it is easy to get started with Photoshop. 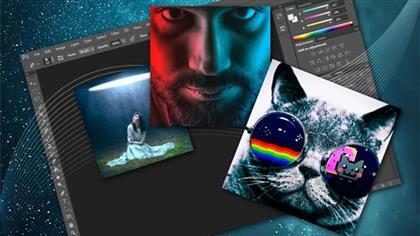 From beginners to seasoned professionals, Photoshop has all the tools and features you need. It's simple to use and easy to understand. Photoshop can turn a beginner into an expert in no time at all. The more you get use to this software, the easier it gets to create high quality designs without the need to hire a graphic designer. Photoshop is the #1 tool for anyone looking to create amazing graphic designs and if you're not using it, then you're missing out big time. Before we go any further, let me give you some insights about Photoshop. Photoshop was launched by 2 brothers Thomas and John Knoll in 1988. The first version of the powerful graphics design software was designed in 1990. Since then it has become the most used software among web developers and designers alike. The first major Photoshop update, Photoshop CS was released in 2003, it was the 8th version of the software and it completely changed the face of the platform. Until this day, 28 versions of Photoshop have been released so far. In an effort to increase accessibility, Photoshop is distributed in 20 different languages. Currently, Photoshop has more than 10 million users worldwide. The software is currently used by both amateurs and professionals. Photoshop is easy to use and remains one of the go to graphics platform. Photoshop has a good number of useful courses. Learn how to create your first image and which features to select when doing it. Learn how to work with the settings when editing images. This course will save you the cost of hiring a graphic designer. Anyone who wants to start using Photoshop Quickly & Easily. Anyone who wants to create stunning graphics using Photoshop. This course is great for beginner level Photoshop users. How to Create Amazing Graphics Using Photoshop Fast Download via Rapidshare Upload Filehosting Megaupload, How to Create Amazing Graphics Using Photoshop Torrents and Emule Download or anything related.